Original 19th Century British Rifle Regiment pouch belt badge. A large example of a British 19th Century Rifle Regiment pouch belt badge. 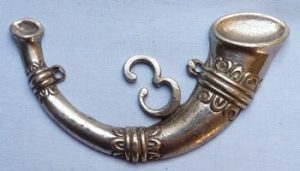 Made from a heavy, solid white metal and with typical strung bugle motif below a number "3". Dimensions are 4.5 inches x 2 inches. 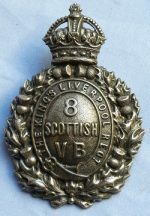 C.1900’s/WW1 Silver Helmet Badge – 8th Scottish Volunteer Battalion- King’s Liverpool Regiment.